The cost of taking care of the elderly is increasing every year. These costs are only going to continue rising as the elderly population doubles by 2050. That means more people are going to need care, and it’s going to cost a lot to provide them with that care. If you have aging parents, one solution is to care for them yourself. Even caring for mom or dad on a part-time basis can help you save money while enabling you to savor every moment that you have left together. But, are you ready for the job? Unfortunately, most families don’t have a plan for how they’re going to care for aging parents. What’s worse is that many families didn’t even consider the possibility. Taking steps early to plan for care later can help ensure that both you and your elderly parents live comfortably. The alternative is waiting for disaster to strike and realizing you have to dish out hundreds of dollars a day on caregiver services when you’d never even thought about the possibility. The trick is to let the pieces of the puzzle fall into place before care is needed. Here are some tips that will help you transition from child to caregiver go more smoothly. It all starts with a conversation, albeit a hard one. You have to discuss how your parents want to be cared for with them directly. You may discover that they already have a plan and have plenty of money set aside to be cared for full-time. If your parents don’t have a plan in place, now’s a good time to make one. Talk about whether they want other family members to care for them, if they would prefer moving into an assisted living facility, or if a medical alert system would be an option. Everyone will sleep better at night knowing that some kind of plan is in place. You aren’t the first family to navigate the confusing waters of senior care, and you won’t be the last. But, that doesn’t mean you have any idea what you’re doing! 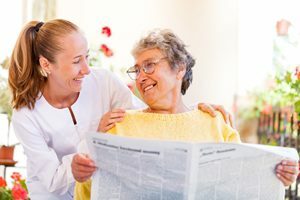 Senior living advisor: Whether your parents are interested in moving into an assisted living facility, they just don’t know which one, or you need help finding caregivers in your area who fit your budget, a senior living advisor can be extremely helpful. If nothing else, they can make you feel like you’re not alone, which is important for many families who have loved ones whose health is deteriorating. Financial advisor: Managing money throughout your life is a challenge, and it continues to be a challenge in old age. A financial advisor can help you adjust investment strategies to provide your parents with the biggest returns, and they can help you identify streams of income and resources that can help you pay for senior care. If your parents haven’t already begun budgeting for their care needs later in life, it’s time to start. It’s never too early or too late to start tucking away money. A senior living advisor can help you determine how much care is likely to cost, while a financial advisor can help you figure out exactly where the funds are going to come from. If your parents already have money set aside for senior care, make sure you talk about how payments will be made (will they be made automatically or will you be responsible for cutting a check each month?) and what kind of care they’re willing to pay for, as well as what they’re not willing to pay for. Starting the conversation can be difficult, but it’s well worth it. Approach your parents with curiosity and compassion and you can create a plan as a team that everyone feels good about.